2.5 Properties of Quadrilaterals: Truth or Lie? Quadrilaterals always have four straight sides. All rhombuses are also parallelograms. All quadrilaterals have interior angles that add up to 360 degrees. All quadrilaterals have 4 vertices. A square is both a type of rhombus and a type of rectangle. A rhombus is a both a type of kite and a type of parallelogram. A rhombus is a special type of kite. A kite with all four sides the same length is a rhombus. A trapezoid can have one pair of parallel sides. A rectangle is a parallelogram that has 4 right angles. Quadrilaterals are always flat shapes. 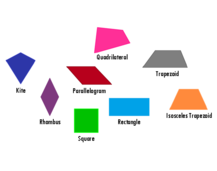 All rhombuses are also rectangles. All quadrilaterals have at least one right angle. A rectangle is a special type of square. A kite is a special type of rhombus. A trapezoid is a special type of parallelogram. Some quadrilaterals have less than four angles. A parallelogram is a rhombus that has 4 equal sides.